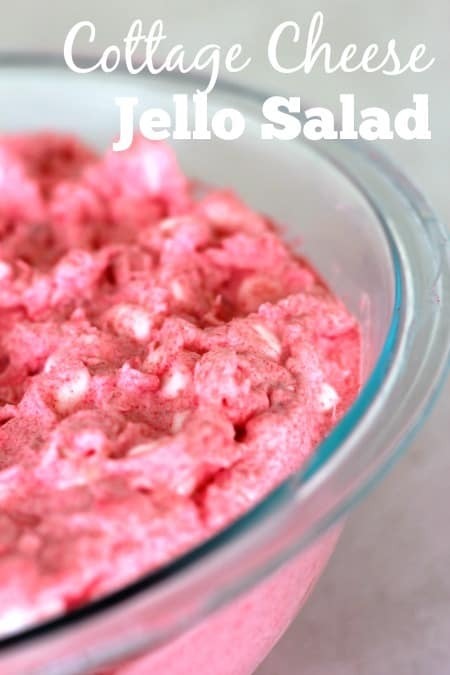 This cottage cheese Jello salad is a favorite family recipe. We have it at most family get together’s, mostly during the summer, but really at almost any time of year. It is really easy to make and you can alter some of the ingredients to change the flavor of it if you like. Drain the pineapple. Get as much liquid out of the pineapple as you can or the salad will end up being too runny. No one likes runny Jelly salad! Place the cottage cheese in a large bowl. Stir the powdered Jello into the cottage cheese. Let it set for a few minutes. What’s great about this recipe is all of the variations you can make to it. For instance you can use lime flavored Jello with the pineapple, or you can use orange Jello and mandarin oranges instead of the pineapple. Some people like to stir a couple of cups of miniature marshmallows into the salad. You might wonder if this salad tastes predominantly of cottage cheese, and it doesn’t. One of my boys who doesn’t like cottage cheese ate some of the salad and told me he thought I had said it had cottage cheese in it? I guess I did a good job of disguising it!